Secured Personal Loans vs. Unsecured: What to Choose? One can choose from two primary types of personal loans: secured and unsecured. Before choosing one type over another, it is best to get acquainted with their specifications to know which one fits you best. We’ll have a look at the similarities and distinctions of the two. Let’s get started! To begin with, secured loans are protected by collateral or an asset of some sort. On that note, if you cannot repay the loan, the lender is entitled to claim the asset to obtain compensation for the money you owe. In other words, when you agree to sign the terms of the loan, you imminently agree that the lender can repossess the asset if you don’t repay the loan. It’s also worth considering that even after a lender repossesses the collateral, you could still owe a certain sum of money. That happens in the event in which the selling of the property doesn’t generate enough money to cover the expenses of the loan. 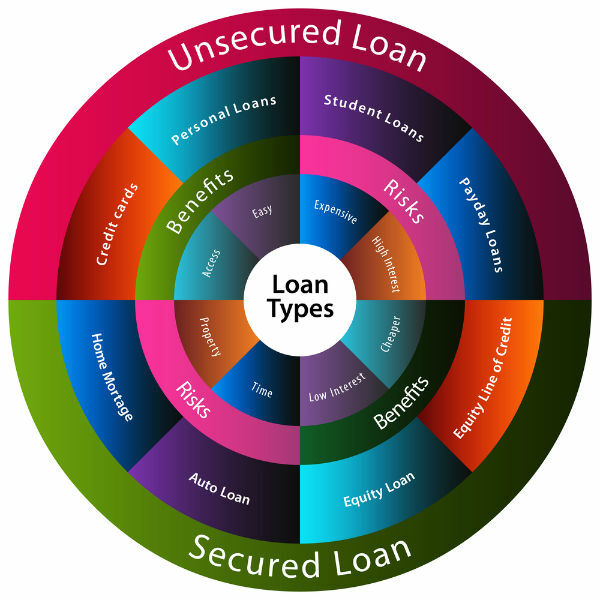 Considering these aspects, you might ask, why would anyone choose secured personal loans over unsecured loans? We’ll get right on it. For starters, you could benefit from lower interest rates than in the case of unsecured personal loans. When you get a secured loan, the lender doesn’t rely merely on your employment situation and credit record. The collateral minimises the risk for the lender, which could help you to benefit from a more convenient interest rate. Evidently, that is because such a transaction is safer for the lender, which diminishes the interest rate. Secondly, if you don’t have the best credit history, getting a secured personal loan isn’t as challenging as getting an unsecured loan. Even though most lenders will take into account the credit score and history, it is not as crucial as in the case of unsecured loans when there’s no collateral included. Nonetheless, if a borrower has a troublesome credit history and a foreclosure or bankruptcy, that is a distinct scenario. Thirdly, personal loans have capped borrowing limits, in comparison with mortgages or refinancing plans that are tied to the value of the property or valuable asset. Still, in some instances, secured personal loans are available for higher amounts, which can be a good thing especially if you’re in need of a significant sum of money. In addition, if your credit score is excellent, you could use this in your favour as it can enhance the amount you can borrow. Moving on to unsecured personal loans, they aren’t tied to any of your properties or assets. On that note, a lender cannot possess one of your properties in the case in which you default on the loan. Typically, to get approved for an unsecured personal loan, you must have excellent credit and reliable income. Take into account that the amount you can borrow is significantly lower since the lender cannot seize one of your possessions to make up for the potential financial loss. Of course, the primary advantage to getting an unsecured personal loan over a secured one is that you don’t place any of your properties or assets at risk. That means you won’t have to stress over potentially losing your car or property in the event in which something prevents you from making repayments. Additionally, the application process is straightforward and quick, which is a good thing, especially if you’re in need of cash ASAP. Still, most importantly, you have to present valid proof that you have a solid and secure source of income and decent credit record. Now moving on to disadvantages, considering that unsecured personal loans are backed up only by trust, they present more risk to the lender. For that reason, you might end up paying high-interest rates. What is more, the loan amounts are smaller than in the case of secured personal loans, which is also something to be taken into account. Each financial decision you make is important as it will inevitably impact your life. Since the market abounds with lenders and brokers, this might make it difficult to make a sensible choice. However, we suggest you analyse your options carefully and select a trustworthy lender such as Personal Loans. This is just as important as choosing the best financial service. To sum it up, secured loans might offer more advantages to those borrowers whose credit record isn’t the best and want to get a significant amount of money. Nevertheless, having access to collateral isn’t always a possibility, which would make unsecured personal loans the sole available option. At the end of the day, it’s up to you to establish which financial service is right for you. If anything, you could seek financial counselling to ensure you’re making the right choice!